The Belgian firm Fixolite was founded, producing elements in lightweight wood-fibre concrete. 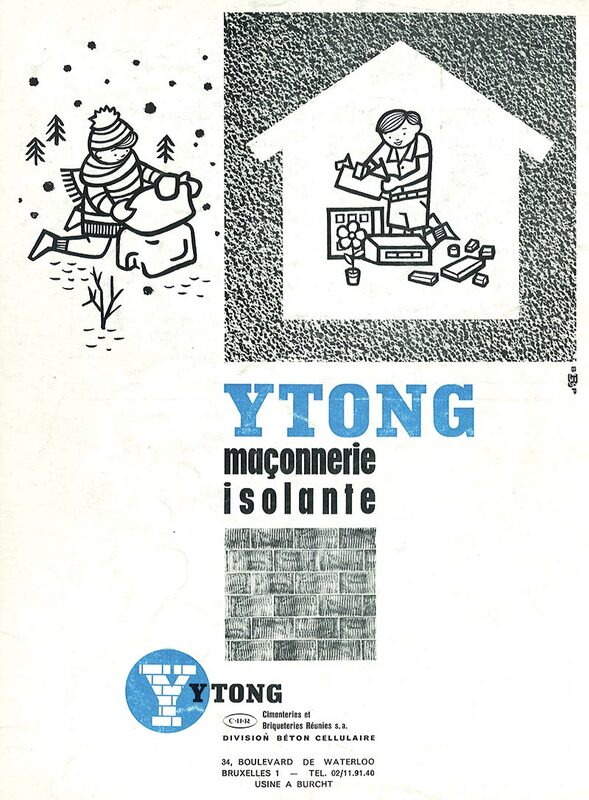 Ytong became one of the most important building materials in Sweden immediately after WWII. Almost all articles on new houses in Brussels published in the architectural press mentioning lightweight concrete refered to Durisol. The Belgian norm NBN 538 defined three categories of concrete blocks for masonry construction, including lightweight blocks. The first Ytong factory in Belgium was erected in Burcht (near Antwerp) in 1954-1955 by Ytobel, producing Ytong from June 1955 onwards. Ytobel invited the editorial board of Bouwen en Wonen to the Ytong factory in Burcht in 1956. 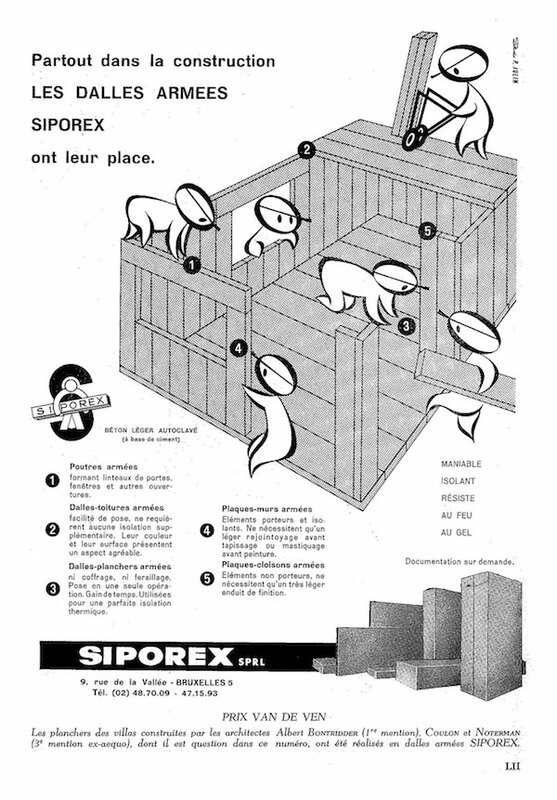 Siporex was developed in Sweden in 1935 and produced on a large scale in Belgium from 1956-1957 onwards by Siporex-Brabant. Bouwen en Wonen featured articles on several brands of lightweight concrete, namely Ytong, Siporex, and Durisol. 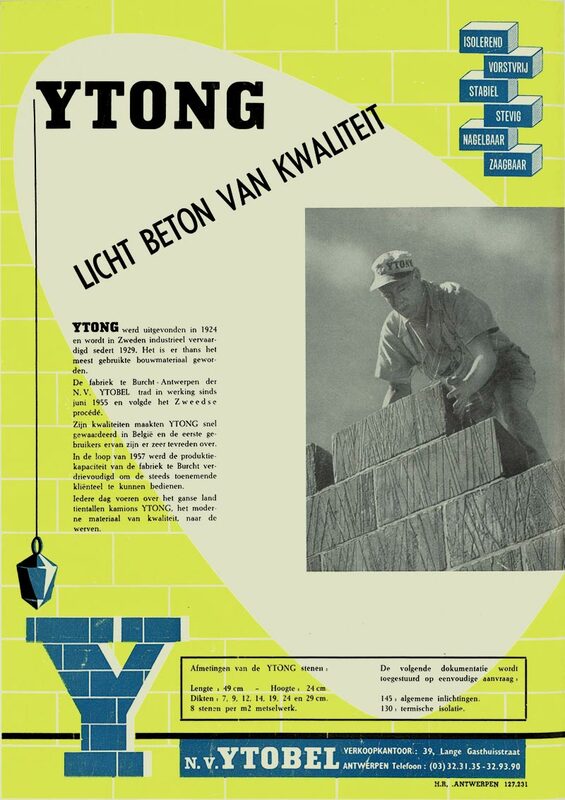 The output at the Ytong factory in Burcht tripled in the course of 1957. 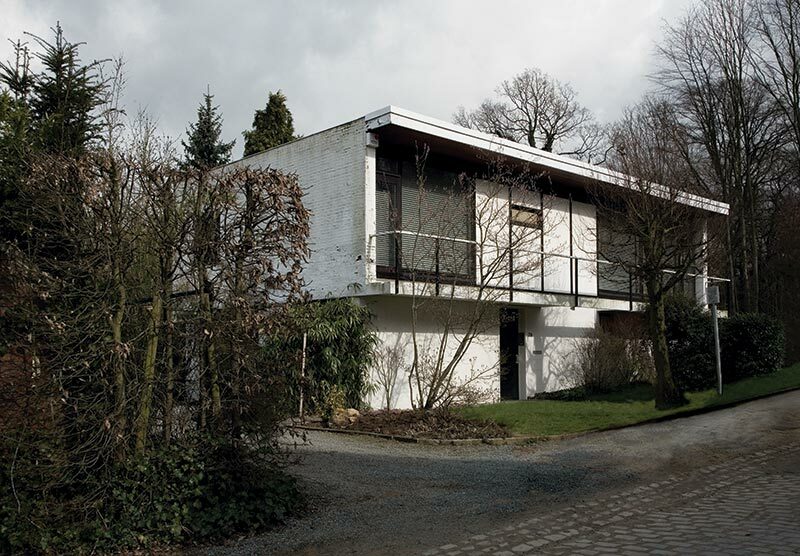 The Durox house, designed by architect Renaat Braem, was erected at the National Building Centre in Antwerp in only five days. A brochure dating from approximately the 1960s-1970s mentioned 34 Ytong factories in 11 countries and factories under construction in four more countries. A list of 72 companies producing Argex blocks, dispersed over the country, confirms the increased popularity of such blocks. The total production of Argex throughout Europe had increased to nearly 6 million m³ per year. It was produced in 13 European countries, including Belgium. The architectural journal Neuf published a table with 73 manufacturers of lightweight concrete associated with the precast concrete federation UACB. Durisol. Concrete is a composite material made of aggregates (usually sand and stones), water, and cement. By adding the adjective ‘lightweight’, it becomes a collective term for different types of concrete that are characterized by a low specific weight. The reduced density, and thus weight, is achieved by adding specific ingredients to the mixture, or by means of special production techniques that increase its volume. Whereas ordinary concrete weighs from 2.000 to 2.500 kg/m³, lightweight concrete weighs approximately 500 to 900 kg/m³. During the interwar period, a number of (international) brands of lightweight concrete were put on the market, but it was not until the post-war period that this relatively new building material made a major advance. Depending on the additives or manufacturing techniques, four main types of lightweight concrete can be distinguished. The first one was autoclaved gas concrete, to which a foaming agent was added. A second type was made with lightweight additives (e.g. wood fibres or expanded clay). Another type was cellular concrete, made with porous volcanic stone like pumice or slag. The fourth type was foamed concrete or ‘béton mousse’, in which a synthetic mousse was injected or which was mechanically ‘whipped’. Because of the specific production and hardening processes, lightweight concrete was normally produced in a controlled factory environment, as prefabricated – also called precast – elements, in the form of blocks, panels, slabs, or beams. Nevertheless, some lightweight additives or ready-mix types of concrete were also used for in situ concrete. Thanks to extensive publicity campaigns, and especially the ease with which lightweight concrete products could be incorporated into traditional Belgian building practice, precast elements in lightweight concrete were very quickly applied on a large scale in residential constructions in Brussels and beyond. Nevertheless, some lightweight additives or ready-mix types of concrete were also used for in situ concrete. Thanks to extensive publicity campaigns, and especially the ease with which lightweight concrete products could be incorporated into traditional Belgian building practice, precast elements in lightweight concrete were very quickly applied on a large scale in residential constructions in Brussels and beyond. Concrete is a relatively heavy building material, hence the many experiments throughout the 20th century to decrease its weight without impairing other properties. During the 1920s and 1930s, many different types of lightweight concrete were developed, e.g. Durisol, Siporex, Argex, and Ytong. Durisol, originally a Dutch-Belgian invention, was widely used in Switzerland from the end of the 1930s onwards, after which it became popular in many other European countries, including Belgium. The autoclaved gas concrete Siporex was developed in Sweden in 1935 and produced on a large scale in Belgium from 1956-1957 onwards by Siporex-Brabant, located in Sint-Pieters-Leeuw. The lightweight aggregate concrete Argex was first produced in Denmark in 1939 under the international brand name Leca. Starting with an annual production in Copenhagen of 20.000 m³, total production throughout Europe had increased by 1972 to nearly 6 million m³ per year. It was produced in 13 European countries, including Belgium. Probably the most famous and first type of autoclaved gas concrete was Ytong. It was invented by the Swedish architect Johan Axel Eriksson, assistant professor at the Royal Institute of Technology in Stockholm. In the early 1920s, Eriksson experimented with different samples of gas concrete and put the mixtures in an autoclave to speed up the curing process. From this, almost by chance, he discovered the improved properties of autoclaved gas concrete. He took out a patent in 1924 and, after five years, found a building material producer, Karl August Carlen, who was willing to invest in a plant. 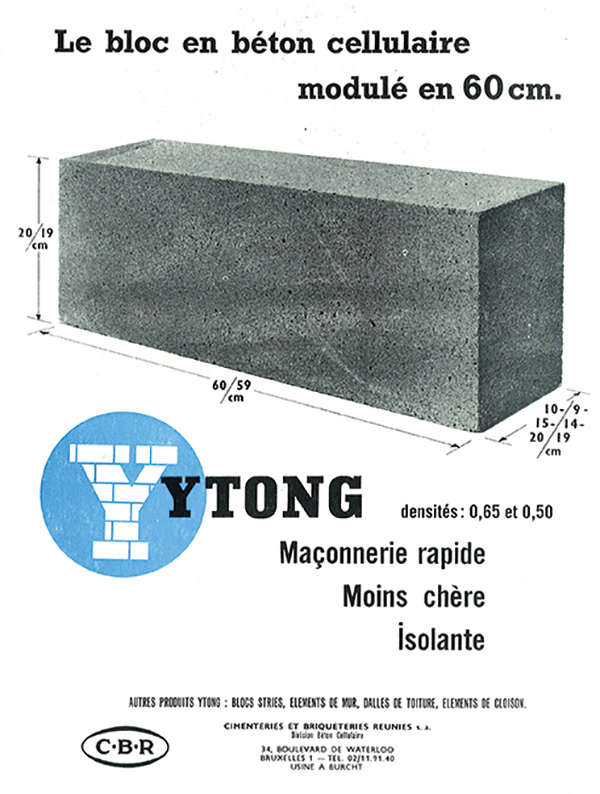 In November 1929, the industrial production of Ytong blocks began. The name combines the y of Yxhult, the town where the first Swedish factory was located, and the end of betong, the Swedish word for concrete. The material was very popular in Sweden from 1935 onwards, with a true breakthrough immediately after World War II, when it became one of the most important building materials in the country. Also, the manufacturing process was exported to other countries and licenses were sold to Norway, Germany, the U.K., Spain, Poland, Israel, Canada, Belgium, and even Japan. A brochure dating from approximately the 1960s-1970s mentions 34 factories in 11 countries and factories under construction in four more countries. Instead of exporting the material itself, Ytong exported the technique and the registered trademark; this allowed it to be adapted to local contexts. For instance, if the original recipe included bituminous schist, local producers could replace this with other (siliceous) materials like fly-ash or slag. To guarantee quality, a central control laboratory was erected in Sweden, and Swedish engineers and technicians visited the factories abroad. 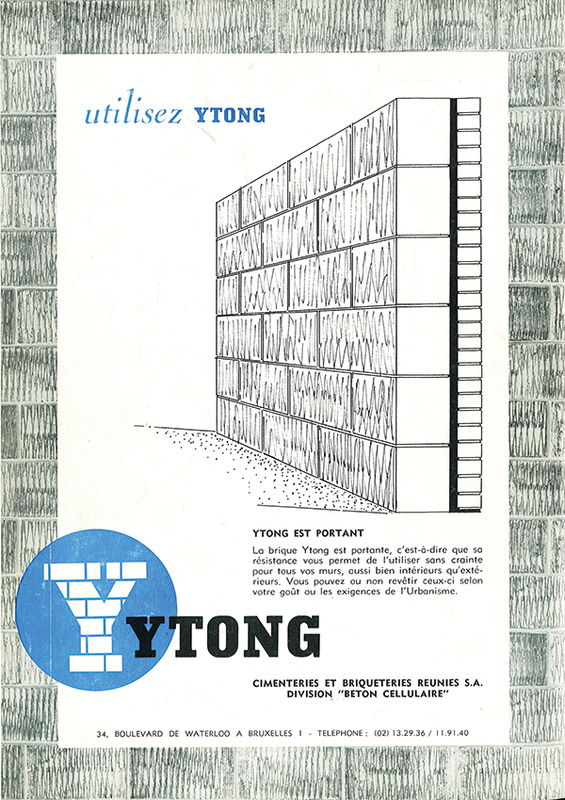 In Belgium, the first Ytong factory was erected in Burcht (near Antwerp) in 1954-1955 by Ytobel, producing Ytong from June 1955 onwards. Ytobel, having acquired the license for the Benelux, followed the Swedish manufacturing process but introduced local ingredients including fly-ash (from the nearby electric power plant in Schelle), blast furnace slag, and fat lime, as well as aluminium powder and water. 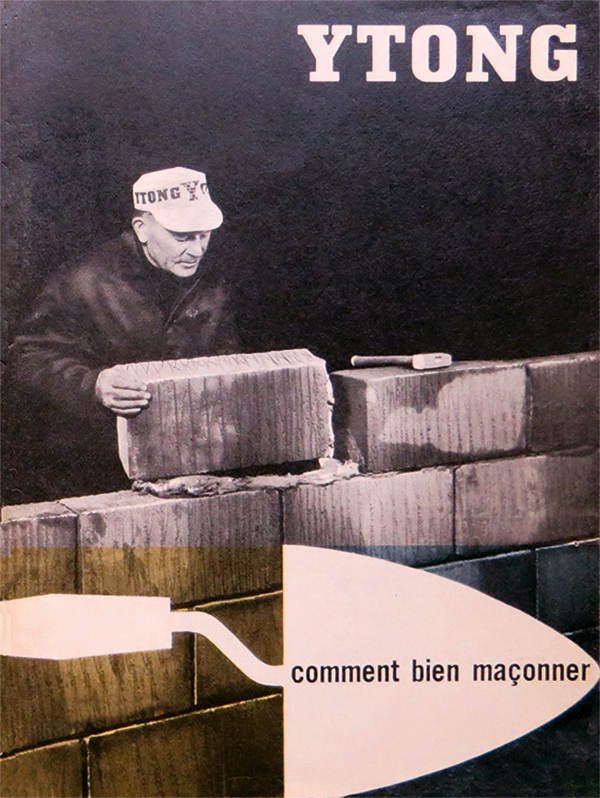 Already in 1955, in a themed issue on concrete, the journal Bouwen en Wonen predicted a swift development for Ytong in Belgium, since the material was already well tested, and the benefits were numerous. The quick advance came to be, and output at the Antwerp factory tripled in the course of 1957. Ytobel was soon after incorporated by the Belgian cement producer CBR (Cimenteries et Briqueteries Réunies). Belgium followed the trend set in other European countries, where Ytong, and lightweight concrete in general, became very popular after World War II. The popularity of lightweight concrete in the post-war period was due to a number of important benefits related to its inherent properties and characteristics. As the name indicates, lightweight concrete is marked by a very low density. A consequence of the low density is very low heat conduction. Furthermore, the material is solid; fire and water resistant; and easy to handle on the building site without heavy equipment. In addition, the loadbearing capacity and the industrialized production of prefabricated elements in lightweight concrete made the material very attractive in a broad field of applications, ranging from houses to industrial buildings. Each manufacturer of lightweight concrete developed its own series of products, with specific characteristics, compositions, and dimensions. And in contrast to the closed systems of heavy prefabrication in concrete, using the material had no significant implications for architectural design. The elements in lightweight concrete were usually easy to handle and to process and could be modified in the field (by sawing or cutting, unless the elements were reinforced with steel bars). It was therefore very convenient for sinking in pipes and conduits during construction. Nevertheless, lightweight concrete had drawbacks: it was easily damaged by mechanical impact; its metal reinforcement had a higher liability to rust; its sound insulating and load-bearing capacities were inferior to those of regular concrete; and it was more sensitive to frost. The precise properties depended, of course, on the specific ingredients and manufacturing technique that had been used. The ingredients and manufacturing process of the brands of lightweight concrete differed, yet for each category or type of lightweight concrete, there were similarities in the basic recipes. In the first category of lightweight concrete, namely autoclaved gas concrete, the special ingredient was a foaming agent, and the three best known brands (Ytong, Siporex, and Durox) all used aluminium powder. After the dry ingredients were prepared (cleaned, ground up, measured, and combined), aluminium powder and water were added just before the mixture was poured into the moulds. The aluminium powder provoked a chemical, foaming reaction, causing a volume increase and creating a porous material with non-interconnecting bubbles of air or hydrogen gas. The amount of aluminium powder added influenced the final density of the concrete. After the mixture had dried and set, the mould was removed, and the concrete elements were sawn into pieces and put into an autoclave. In the autoclave, the pieces were brought under steam pressure to finalize the chemical reaction and give the material its full strength. For instance, Siporex elements were kept in the autoclave for at least 16 hours, under a minimum pressure of 10 bars, while Durox emphasized that the temperature inside the autoclave had to be between 180 and 190° C.
Although the exact time, temperature, and pressure differed from one brand to another, treatment in the autoclave is the second characteristic feature of this type of lightweight concrete. The autoclave treatment distinguishes it from the less common air-cured gas concrete, for which a reactive agent was used, but the product set and dried under normal atmospheric pressure. Autoclaved gas concrete can be compared to baking bread: the aluminium powder fulfils the same function as yeast and increases the volume of the mixture, but you still need to ‘bake’ it to give it its final properties. Just as each brand had its own autoclave procedure, they also used different ingredients, which could vary according to local conditions. The standard composition of Ytong, for instance, included lime and silica, mixed with aluminium powder. By slightly varying the relative proportions of the ingredients (approximately 30% lime and 70% silica), two standard types of Ytong were produced: the so-called blue Ytong and yellow Ytong. They had the same appearance yet different densities, λ-values, and compression values (650 kg/m³, 0.139 W/mK, and 4.90 N/mm² for blue Ytong, as opposed to 500 kg/m³, 0.104 W/mK, and 2.94 N/mm² for yellow Ytong). Siporex was manufactured in the same way as Ytong yet used cement rather than lime as a binder, as well as silica and fly ash, mixed with aluminium powder. Durox used quartz sand (or silica sand), lime, cement, and – again – aluminium powder. In the second category of lightweight concrete, namely concrete with lightweight aggregates, the various brands were more dissimilar due to the different types of aggregates each used. The usual aggregates were wood fibres or expanded clay. Wood fibres were used by Durisol and Fixolite. Durisol was developed in Belgium in 1937 by the Swiss nationals August Schnell and Alex Bosshard (following a Dutch patent of 1932), and it had little impact initially. In 1938, these two men founded Durisol AG für Leichtbaustoffe in Dietikon, which effectively pushed its industrial development and allowed the company to break into international markets, including the Netherlands, France, and Belgium, after World War II. The Belgian firm Fixolite was founded in 1945. Due to its rapid success, it soon set up a new production site in Thiméon. The general recipe for lightweight wood-fibre concrete was to mix cement (mostly Portland cement) and water with clean, mineralized scraps of wood. The chemical treatment of these fibres made them resistant to moisture, chemicals, and other harmful agents (rot, mildew, fungus), so that the final product was weatherproof and fire resistant. Durisol indicated that other fibrous (waste) materials could be used, from textile and vegetable products (e.g. waste from cane sugar plants, coconut fibres, grasses, cotton stalks), yet this was far less common and no examples thereof are known in Brussels. The process for manufacturing Durisol (presumably similar to that of Fixolite, although no details thereof were found) started with pouring the mixture into moulds, with or without a (steel) core or internal counter mould to create hollow elements. Afterwards, the moulds were vibrated to create a perfect fill. The moulds were almost immediately re-moved, thanks to the relatively dry mixture. After five days, during which the initial setting took place, the elements were accurately trimmed to the desired dimensions. Then they were moved to an open-air storage site where they rested for another six weeks, before being transported to the construction yard. Expanded clay was another popular lightweight aggregate used in concrete constructions. It is best known under the brand name Argex (an acronym for ‘argile expansé’ in French), which is known as Leca outside the Benelux (the acronym for ‘light expanded clay aggregate’). Expanded clay was produced in the form of dark brown granules with rough surfaces: they have a cellular structure, yet the outer shell of the granules is somewhat denser than the core. Because of this dense shell, the weight and insulating capacity varied with the size of the granules. The granules were divided in three classes according to their size: 0 to 3 mm (weighing 650 kg/m³, λ = 0,186 W/mK), 3 to 10 mm (425 kg/m³, λ = 0,105 W/mK), and 10 to 20 mm (350 kg/m³, λ = 0,093 W/mK). Because of the many voids and cavities, Argex granules absorbed a lot of water and needed to be moistened before being mixed with a binding agent (mostly cement, but also mortar, plaster, bitumen, and resins could be used). The properties of Argex are similar to other baked clay products: it is stable and inert, inorganic, and rot-proof. In addition, it does not age or corrode, resists most acids and bases, can stand temperatures up to 1000° C, has a good pressure resistance, and does not shrink. The production of Argex granules happened in several stages. After being excavated from clay pits, the clay was prepared, dried, granulated, and baked in a rotary oven at temperatures up to 1150 or 1200° C, and finally it was sifted and stocked. The high temperature caused the clay granules to expand, which was a defining phase in the production process, determining its final properties. From the end of the 1960s onwards, Argex experimented with the expansion process to create a special type of ‘Agrex S’, which had an increased density and better resistance properties than the three regular types of Argex. Argex was used as lightweight aggregate in precast concrete elements (blocks, slabs, permanent formwork for walls, etc. ), but the granules could also be delivered in bulk to be processed on the construction site. They could also be incorporated in ready-mix concrete, in cavernous or semi-cavernous concrete – for instance, used in monolithic walls, or as a lightweight (sloping) screed in the roof system Ventitak or the floor system Thermosol. Blocks were by far the most common type of precast elements in Argex concrete. They were produced by numerous companies, for instance, J. Van den Heuvel, with two production plants, in Hemiksem and Kruibeke. Their line of loadbearing blocks VDH consisted of both hollow and solid blocks, with various dimensions (commonly 39 cm wide and 19 cm high, and a depth between 6.5 and 29 cm) and various strengths, weights, and properties, each carrying a unique code. The gamut of blocks was completed with other precast elements in Argex concrete (panels, lintels, floor slabs, etc. ), also produced in many different (yet modular) dimensions. In addition to regular Argex and Argex S, Agral was used in a concrete mixture, according to some contemporary documents and catalogues: it was similar to Argex, but made with expanded slate instead of expanded clay. Agral was produced in Belgium by the Société d’Agrégats Légers Agral, located in Hainaut. Key ingredients of cellular concrete, which was air-cured instead of autoclaved, were cellular aggregates, such as volcanic stone like pumice, or slag. Pumice is a natural material: it is created when, after a volcano erupts, liquid lava cools extremely rapidly, trapping gases and leaving bubbles in the stone. Blast furnace slag and clinker, although non-natural materials, have a similar chemical composition – usually a mixture of silicon, aluminium, and oxides created during the production of iron – and cellular structure – the heating and cooling during the production process creates many small voids in the material. As slag is a by-product, the composition and properties thereof varied and needed to be monitored to ensure its quality. The cellular, porous structure of both pumice and slag made them ideal to use as aggregates in lightweight concrete, resulting in a mixture with good insulating qualities. The high temperature processes by which these aggregates were produced made this type of concrete also resistant to high and low temperatures. Neither slag concrete nor ‘pumecrete’ (concrete with pumice) were typical post-war building materials, but were well in use before World War II. The history of pumecrete goes back to the Roman period. Slag and clinker concrete were very popular after World War I as an alternative building materials during the reconstruction (for instance in the construction of social housing), yet used without the technical knowledge and equipment of the post-war period. The technology and production process were very similar to those for making regular concrete, except some of the normal aggregate (gravel, crushed stone, or sand) was replaced by pumice or slag. The aggregates were prepared and mixed with water, cement, and sometimes additives, then the mixture was poured into moulds (prepared with reinforcement or not), if necessary pressed or vibrated, and then left to dry before being de-moulded. The details of the mixture and production process were of course specific for each brand: a large variety of products was available, in many forms and dimensions, each with brand-specific characteristics such as pressure resistance (commonly between 3.43 and 4.90 N/mm²), density (from 700 to 1100 kg/m ³), and thermal conductivity (between 0.14 and 0.35 W/mK). Given the relatively low-tech process for producing pumecrete, many companies produced and/or sold pumice or pumecrete in Belgium. Examples are Locomo (importers of ‘bims d’origine’ or ‘original pumice’), Bims Rhenan, the Comptoir Central Belge du Bims CCBB, Subelco, and Société Anonyme des Produits Synthetiques. The latter produced, among other things, Legisol products, short for ‘légères – isolantes – solides’. 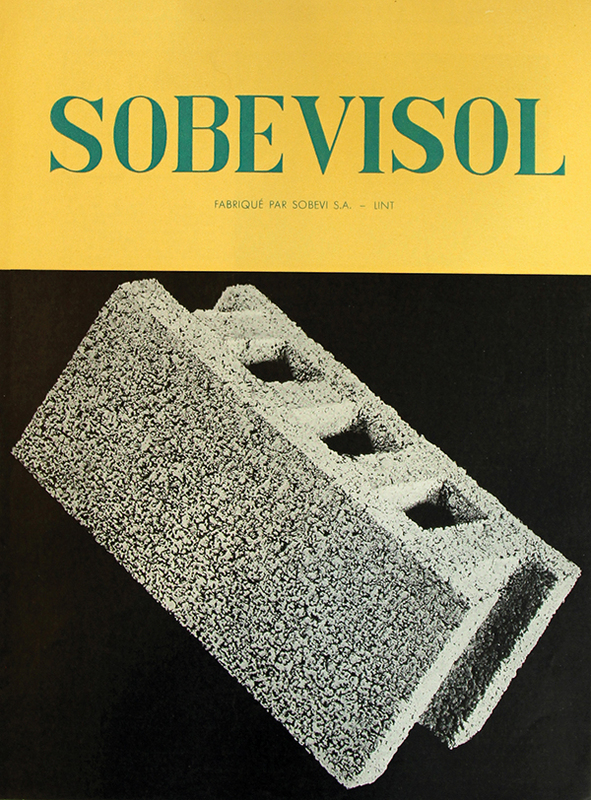 Slag or clinker was used, among others, by Sobevi (Société de produits en Béton Vibré), especially for the hollow and solid blocks in their ‘insulating’ product range Sobevisol. Foamed concrete or ‘béton mousse’, the fourth category of lightweight concrete, was far less common than the other types. Within this category, a distinction can be made between concrete in which a synthetic mousse was injected, and concrete that was mechanically ‘whipped’. The first type was a ready-mix concrete: synthetic mousse was injected into wet concrete and formed little bubbles of air (with a diameter smaller than 1 mm), creating a concrete with a cellular structure. 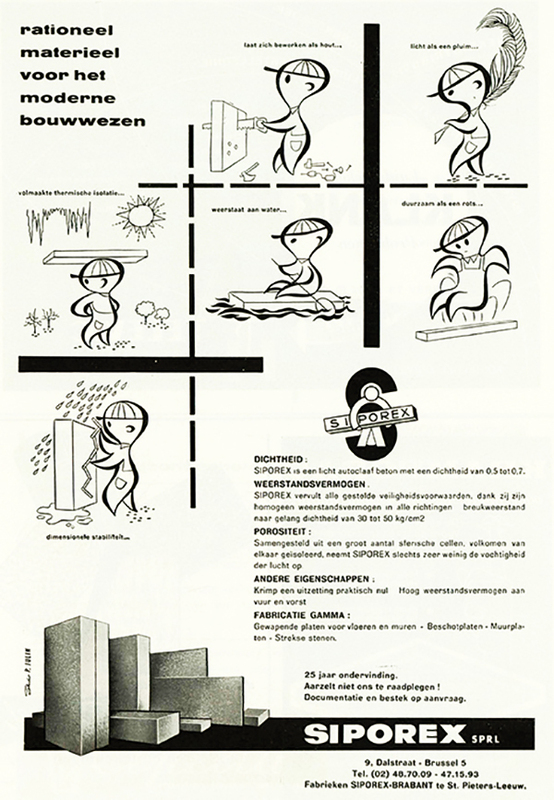 It was produced by Interbeton under the brand name Celmix and came in three varieties: Celmix L, Celmix M, and Celmix H. The properties of each type varied according to the relative proportion of the ingredients and synthetic mousse (density between 500 and 1700 kg/m³, pressure resistance between 2 and 12 N/mm², and λ between 0.25 and 0.70 W/mK). The second type of foamed concrete was created mechanically, by beating and whipping the concrete to include air in the mixture. The mixture, which was stable and homogeneous, was put into moulds and then left to dry in open air. The Brussels firm Lanco produced precast elements in this foamed concrete. The main benefit of lightweight concrete, namely its low specific weight, had structural and financial effects on different levels: reduced transportation costs; lighter loads on structures and foundations (thereby enabling lighter and cheaper structures); and lower costs of manual labour. The latter was first and foremost the case with precast elements and, to a lesser extent, with lightweight ready-mix concrete: workmen could lift precast lightweight concrete elements more easily than their regular counterparts, so larger elements could be used and the pace of construction increased. 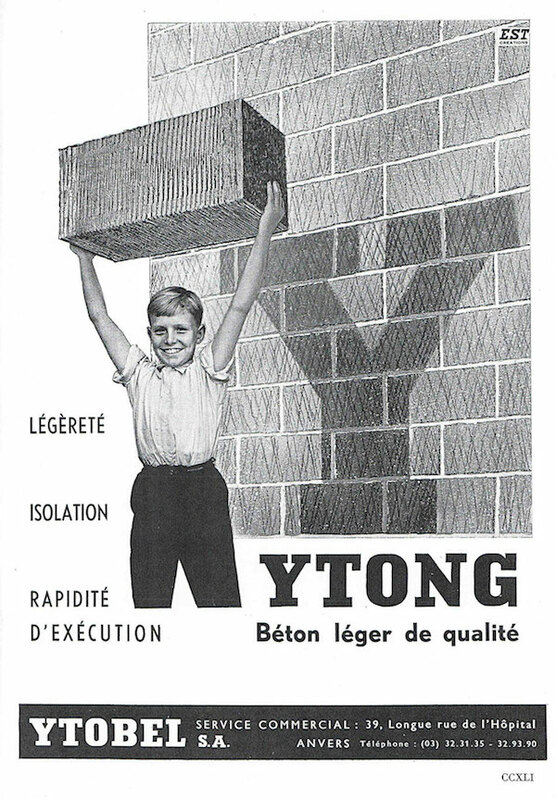 Ytong, for instance, advertised the fact that only eight Ytong blocks were needed for one square meter of masonry. The high construction speed was one of the main reasons why lightweight precast elements became so popular. Lightweight concrete blocks were readily substituted for bricks in loadbearing and dividing walls. The blocks were usually rectangular, although some T-shaped or special connection blocks were put on the market as well. Companies made a relatively small number of standard heights and widths (e.g. 49 cm wide and 19 cm or 24 cm high, or 61 cm wide and 25 cm high), yet offering them in various thicknesses (from 5 to 50 cm, with regular intervals). The thickness was indeed a determining factor in choosing the right type of block for a particular wall construction; thickness was difficult to adjust, whereas the desired height or length of the wall could be achieved by sawing one row or column of blocks to the right size. For the construction of walls, lightweight concrete blocks were stacked like bricks, with a regular cement-sand mortar to bind the blocks together. Some types of blocks had grooves on the left and right sides, in order to interlock with adjacent blocks and stabilize the wall. Because of their porous character, blocks of certain brands (like Ytong, Siporex, and Argex) needed to be submerged or sprinkled with water to prevent them from extracting water from the mortar. 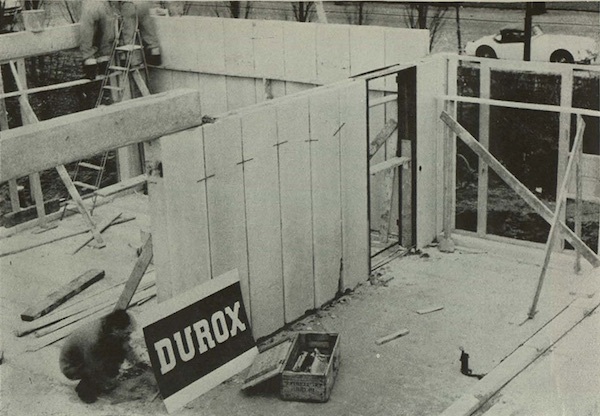 From the 1940s onwards, glue-mortar was also used instead of regular mortar, which reduced the joint thickness from 7 mm to 2 or 3 mm and hardened faster (types of glue were Disbofix by the German company Disbon, the Dutch Durofix-glue, and the stone glue Calsifix by the Luxemburg firm Calsilox). In theory, some types of blocks could also be used in completely dry constructions, with small plastic ‘cookies’ inserted in small slits to join the elements together, enabling easy alterations and dismantling later on. Most brands produced hollow as well as solid blocks, in different weights and sizes. If the hollow blocks had no bottom, like the ones by Durisol and Fixolite, they were used as a permanent mould for loadbearing walls in monolithic concrete: the blocks were stacked, reinforcement bars were placed inside if necessary, and the blocks filled with concrete. To increase the general stability of the wall, special blocks with semi-circular openings on the side were used to allow the concrete to spread out equally. The total height or number of floors that could be constructed depended on the specific type of block: one to five storeys was relatively common, yet Fixolite walls went up to 12 storeys and Durisol even claimed that buildings up to 28 storeys were (theoretically) possible. To bridge doors and window openings in the walls, most brands produced (reinforced) lintels and beams in lightweight concrete, based on the same modular dimensions as their blocks and panels, so that they could be easily combined. With the lintels prefabricated in the same material as the walls, cracking due to a different thermal expansion was ruled out. Another solution was to work with the same blocks as were used for the walls and bind them together with special reinforcements or connections. Walls were also built with prefabricated panels and slabs in lightweight concrete. 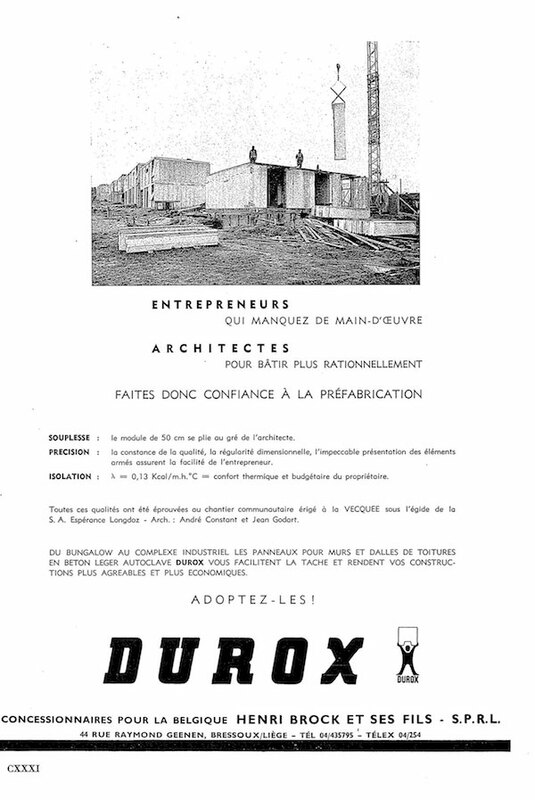 A number of companies, like Siporex and Durox, even featured houses completely erected with precast panels in lightweight concrete in their advertisements. An example thereof in Belgium was the Durox house, designed by architect Renaat Braem and erected in March 1960 at the National Building Centre in Antwerp in only five days. For constructing walls, the panels were placed next to each other, standing upward horizontally (loadbearing walls for single-storey constructions), or rotated 90° and stacked on top of each other (as infill panels in a skeleton frame construction). If necessary, the panels were nailed together, and to the floor. The panels usually had grooved or chamfered sides to join them together. Joints were filled with a cement mix or, later on, with a special type of glue. Two standard widths for panels were 50 and 60 cm, yet they existed in various lengths and thicknesses. Many companies also produced smaller panels, more like tiles than panels (e.g. 50 by 50 cm, or 39 by 24 cm), which were used principally to cover loadbearing walls. In addition, a few brands also produced special panels, e.g. the Siporex sandwich panels, which had a layer of polystyrene foam between two layers of gas concrete; these were produced from the 1960s on, yet they seem to have been used very rarely. 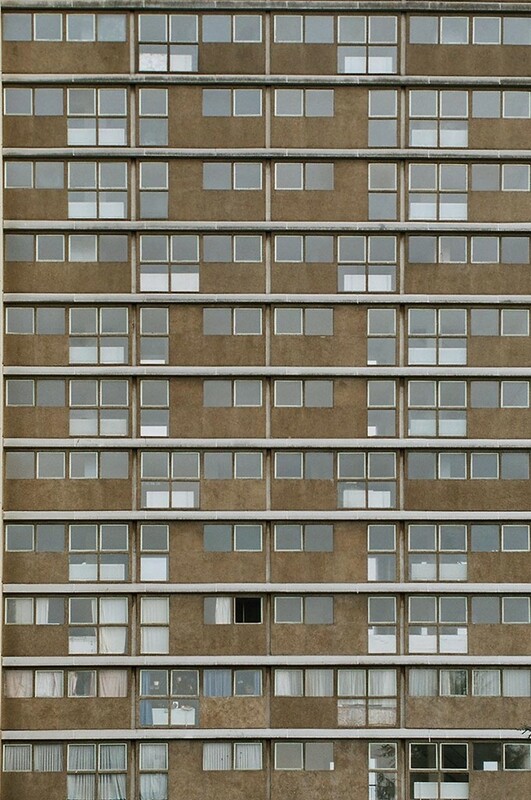 Fixolite also produced sandwich panels, yet these were inversed: the core consisted of lightweight wood-fibre concrete and the surfaces were finished with plaster, asbestos-cement, or other finishing materials. The large panels used for walls could also be used for floors, yet only if they were reinforced with steel bars. Trimming or sawing these floor panels was therefore not possible. Many companies also produced floor slabs or elements for precast floor systems, e.g. Argex, Bims d’Origine, Bims Rhenan, Comptoir Central du Bims, Durisol, Durox, Fixolite, Siporex, and Ytong (see chapter 4 on precast floor systems). Lightweight panels, tiles, and blocks could be finished in many different ways: cement rendering, stucco, plaster, etc. The technique selected depended on the composition and texture of the blocks or panels. Ytong, for instance, produced smooth and carved blocks, each requiring a different finishing. In general precast lightweight concrete had a rough texture, facilitating the adhesion of a finishing render. To answer the criticism that it was too soft, not impermeable, and not aesthetically pleasing, different options for its external treatment were elaborated: the walls could be painted with a waterproof bituminous paint or rendered with mortar, making it waterproof and improving the resistance to impact. Precast elements in lightweight concrete came in many different shapes and sizes. Interesting in this respect is the table in the May-June 1972 issue of the architectural journal Neuf. This table includes 73 manufacturers associated with the Union for Agglomerates with Cement of Belgium (UACB) that made lightweight concrete products. The list indicates the products that each company made, e.g. solid and hollow blocks, prefabricated floors, wall elements, and insulation panels. It also indicates which type of lightweight concrete was used, using the categories of lightweight concrete based on vegetal fibres; gas or cellular concrete (reinforced or not); concrete with expanded clay; pumecrete; or another type of lightweight concrete. The most commonly produced items were hollow and solid blocks made with expanded clay, followed by solid and hollow blocks in pumecrete. The popularity of elements in expanded clay is confirmed by a list of producers of Argex blocks dating from the 1970s that contains 72 companies, dispersed over the country, including small (family) businesses as well as large building companies. The high number of manufacturers shows the extent to which Argex blocks had infiltrated in the Belgian building industry. Any concrete company, small or big, could in fact make concrete with Argex granules. Autoclaved gas concrete, in contrast, required special equipment to produce; a smaller number of large, specialized manufacturers, fully utilizing their machinery, dominated its manufacture. Although lightweight concrete could be implemented relatively easily in post-war building practice, the manufacturers nevertheless needed to convince clients, architects, and contractors to use their products and to acquaint them with the properties thereof. In addition to providing commercial brochures and company catalogues, several companies organized events and initiatives for potential clients. Ytong, for instance, developed an extensive and multi-faceted marketing strategy. 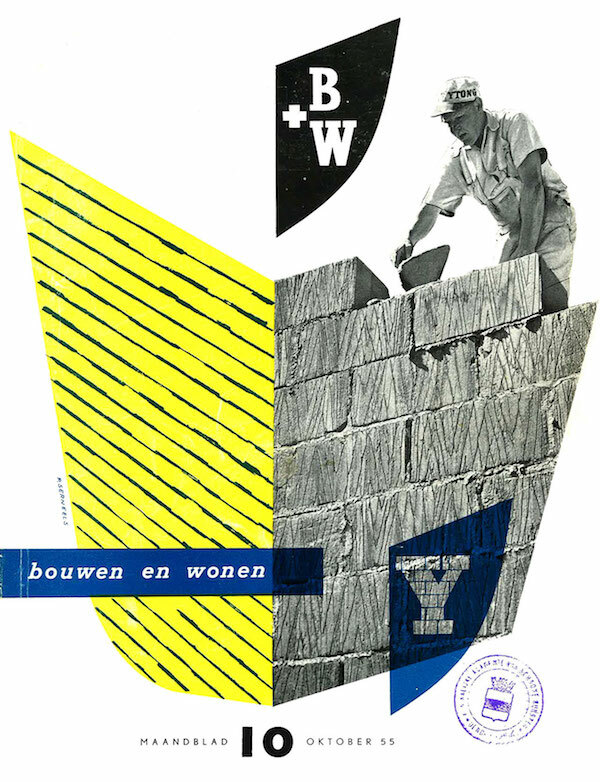 The firm offered bricklayers technical training by an expert at the construction yard, to show them how to use Ytong blocks; invited the editorial board of Bouwen en Wonen to the Ytong factory in Burcht in 1956; and organized a design competition to acquaint architects with the material (which was announced in La Maison in 1969). Another strategy was to closely cooperate with architects on specific buildings and experiments. An example of this, already mentioned, was the Durox house by Braem, erected at the site of the National Building Centre in Antwerp. The journal Bouwen en Wonen reported regularly and extensively on new and innovative building products and techniques, more than other contemporary journals, thus providing specific data on their material characteristics and physical properties. 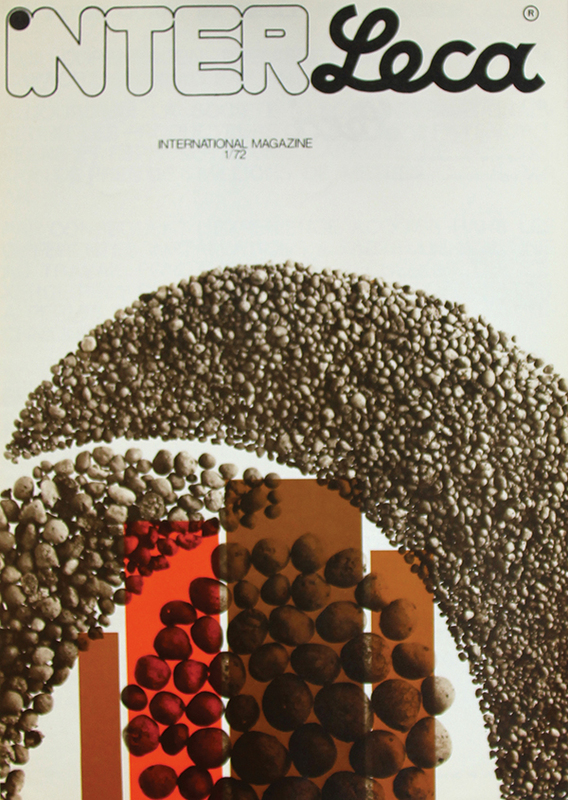 A case in point is the issue of October 1956, which featured articles on several brands of lightweight concrete, namely Ytong, Siporex, and Durisol. Other architectural journals, such as La Maison and Architecture, were rather economical with technical information: articles might mention that lightweight concrete was used in a project, but without technical or scientific details. Besides the commercial publications, potential customers also needed independent, objective information about these novel materials. An example of efforts to develop scientific and technical knowledge was the organization of a full-fledged technical meeting on gas concrete in Rotterdam in 1969. This development, as well as the increasing use of lightweight concrete, prompted government officials to assess and regulate this new building practice. In France, for instance, the production of blocks in autoclaved gas concrete was regulated through a norm in 1975. In Belgium, the norm NBN B 21-004 on elements in reinforced, autoclaved gas concrete was issued later, not until 1992. Before that, the practice of using blocks in lightweight concrete was subject to the Belgian norm NBN 538. 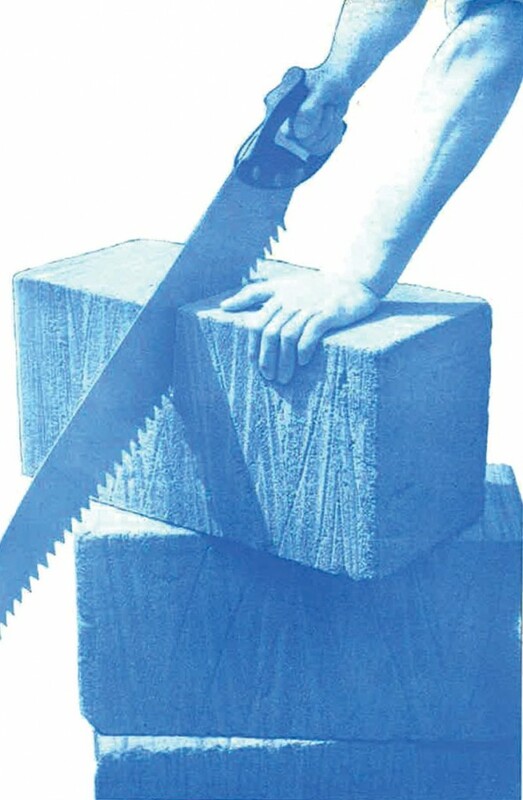 This norm, first issued in 1952, dealt with quality requirements of concrete blocks for masonry construction and defined three different categories, depending on weight and compressive strength: the limiting values for lightweight blocks were set at 1200 kg/m³ and 2.94 N/mm² (as opposed to 1900 kg/m³ and 5.88 N/mm² for the category of semi-heavy blocks, and an unlimited weight and 9.81 N/mm² for the category of heavy blocks). In addition, quality assessment was enabled through the Benor quality label. Ytong received the Benor quality label for its ribbed blocks in autoclaved gas concrete B.S. (‘blocs striés’, intended to be covered with mortar) and for its smooth blocks in autoclaved gas concrete B.L. (‘blocs lisses’, to glue together). Lightweight concrete can be considered as an ‘improved traditional’ building product: by steering a middle course between innovation and tradition, such products made use of often common or familiar materials but with enhanced technical, economical, or architectural characteristics, and standardized dimensions. As for lightweight concrete, it was mainly used because of its economical and pragmatic advantages (lighter, quicker, cheaper), yet still within a relatively traditional concept. The properties attributed to the materials – prefabricated, rationalized, and innovative, for example – were not, or not necessarily, manifested in the buildings in which they were used: building practice might have changed, yet architectural design practice was relatively unaltered. 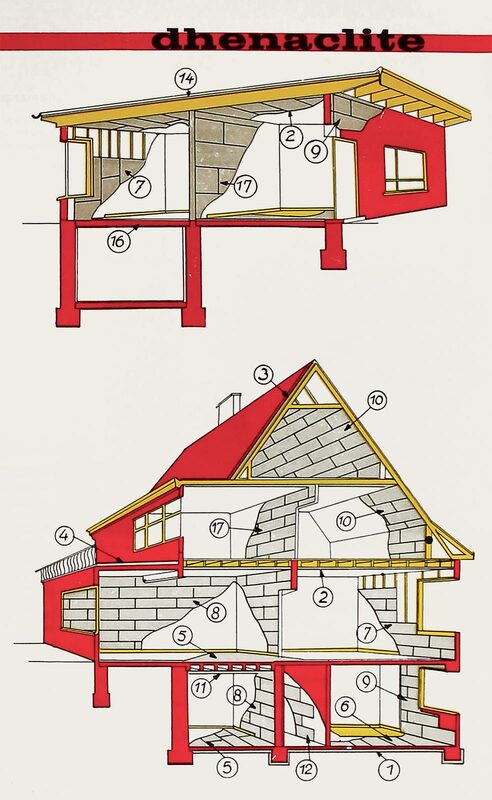 This is very clear in the common practice of building the inner wall of a cavity wall with lightweight concrete blocks and the outer wall in ordinary masonry in front of it. This seemed to be a very popular application, despite, or perhaps because of, the fact that the lightweight concrete blocks literally disappeared behind the masonry. A striking case in point is the housing project Ban Eik in Wezembeek-Oppem by the architects of Groupe Structures: 289 single-family houses were constructed with inner walls of Ytong, and were covered with external walls of traditional bricks. Such applications are completely in line with the ‘improved traditional’ building concept. There are also a number of typical post-war, high-rise apartment buildings that made use of lightweight concrete, for example, Kiel in Antwerp by Braem and Plaine de Droixhe in Liège by EGAU, both constructed with Durisol blocks. In this category of applications too, the material is hardly visible: lightweight concrete blocks were often used for non-loadbearing walls within a reinforced concrete skeleton structure and usually covered with plaster or cladding materials. In addition to these invisible and ‘generic’ examples of lightweight concrete, there were a few ‘specific’ projects which took lightweight concrete building products as the start of the design, and in which the manufacturer was closely involved from the outset. Of these specific applications of lightweight concrete, the already mentioned Durox house is an interesting case: the design of this single-storey house was entirely based on a module of 50 cm, being the standard width of Durox panels. While Braem did not succeed in executing this prototype on a larger scale, architects Constant and Godart did manage to construct a social housing project in Seraing with 60 houses that had inner and outer walls made with standard Durox panels of 2.50m by 0.50m. Of the houses and apartment buildings in the Brussels Capital Region that were published in the post-war architectural press for which materials and construction techniques were mentioned, some 40 cases, or approximately 25% of the total, involved lightweight concrete. Most articles simply refer to the use of lightweight concrete without providing any details, yet in a few cases the brand Ytong was explicitly mentioned, and Durisol appeared in almost a dozen cases. 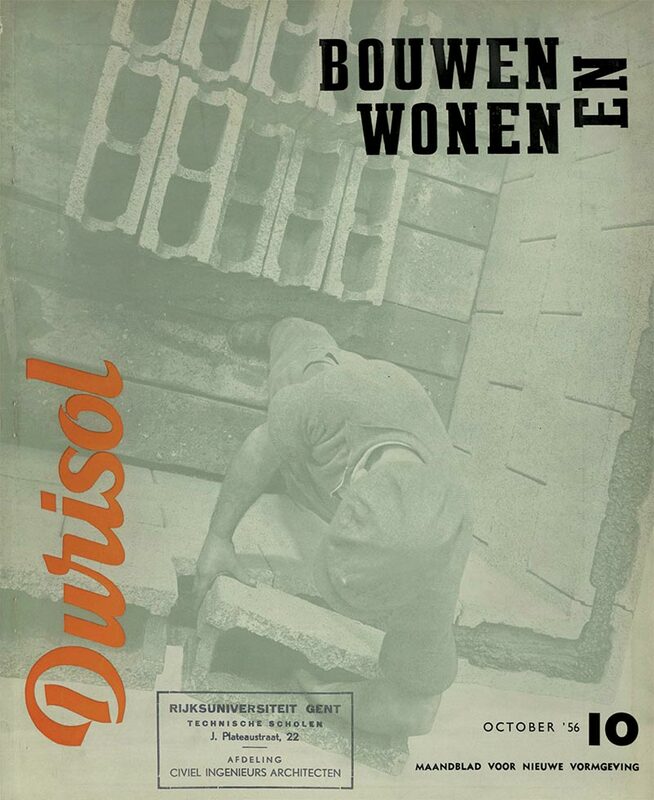 The success of Durisol may be attributed to its early development and Belgian origin: the few cases dating from before 1955 all used Durisol, not surprisingly as the Ytong and other factories were only erected in the mid-1950s. In addition, the versatility of Durisol was an important aspect: Durisol blocks were used either as permanent forms for in situ concrete or as precast elements, for both walls and floors. In one fourth of the projects with lightweight concrete, mention was made of lightweight concrete floors. Half of these used Durisol; the other cases were described as lightweight concrete floor slabs or hollow core slabs, or an insulating concrete screed or roof made with pumecrete. In over 80% of the cases, lightweight concrete was used for the construction of walls: blocks seemed to have been far more popular than panels, sandwich panels, and monolithic constructions. As for the structural design, there was a balance between loadbearing walls and infill walls of a skeleton structure. However, there seems to have been an evolution in the use of lightweight concrete for walls, from infills principally to loadbearing walls, with a switch occurring around 1960. This evolution is, however, difficult to confirm: it might solely be attributed to the publication strategy of the journals, as they devoted more attention to low-rise housing (freestanding houses and bungalows) from the end of the 1950s on. A few exceptions to this were the high-rise buildings with lightweight concrete: Le Groupe Florair in Jette (four freestanding apartment buildings of 11 floors by Remy Van der Looveren, with in situ monolithic cellular concrete), the high-rise social housing building Ieder Zijn Huis by Willy Van Der Meeren in Evere (with sandwich panels with lightweight concrete), and the freestanding, social high-rise of 13 floors by Groupe Structures in Brussels (with the inner leaf of the cavity walls and the interior walls in lightweight concrete blocks). Go to the image archive or Read "thermal and acoustical insulation"